The Nady DM-70 Dynamic Instrument Microphone is versatile and intended for capturing high SPL signals such as drums, percussion, amplifier cabinets and more. The DM-70 is an ideal choice for both sound reinforcement and recording applications, and features a neodymium element for fast transient (peak) response, high headroom and low distortion. The cardioid polar pattern minimizes leakage and extraneous signals from other instruments, ambiance, etc. The DM70 includes a rubber mount that also aids in absorbing noise due to vibration, shock and handling. Box Dimensions (LxWxH) 11.6 x 5.3 x 3.1"
DM-70 Dynamic Instrument Microphone is rated 5.0 out of 5 by 1. 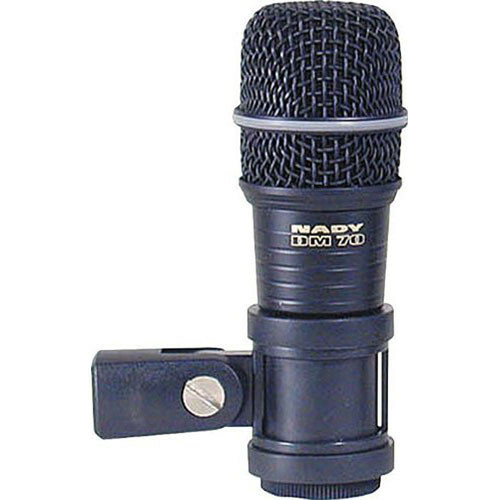 Rated 5 out of 5 by Recorderman John from Excellent Microphone I've had two of these mics for about 5 months, and haven't run into any problems. I use them for toms, snare, guitar cabs, and even vocals. They sounds great, and I'll probably buy more soon. I'd definitely recommend them.